Choose the drug handbook trusted for nearly 30 years! 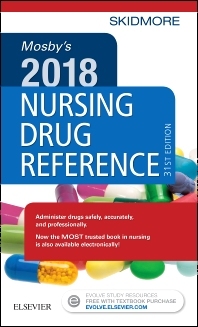 From the leading name in nursing, Mosby’s 2018 Nursing Drug Reference is a full-color portable nursing drug handbook that makes it easy to find the most vital information on the drugs that nurses administer most frequently. More than 5,000 drugs are profiled — including 20-30 new entries for drugs recently approved by the FDA. . No other drug guide places a higher emphasis on patient safety, with Black Box Warnings for dangerous adverse reactions, Safety Alerts for situations requiring special attention, and a focus on both common and life-threatening side effects. Backed with practical online resources, Mosby’s Nursing Drug Reference proves there is a difference in drug guides. It’s Mosby’s bestselling drug reference for nurses! Nursing Process steps are used as the framework for organizing all nursing care information.Overview of drug categories explains the safe administration of common classes of drugs, as well as their common side effects and interactions.